Avatar Adi Da gives humorous and loving answers to questions from children and speaks of the freedom and the responsibility that parents and guides must grant to children for the sake of their “growth and out-growing”. Listen to this CD for the chance to hear Adi Da recite “A Child’s Guide to Happiness” from His Happenine Book—recorded in 2006, and published for this first time on this CD. An audio celebration for kids of all ages! 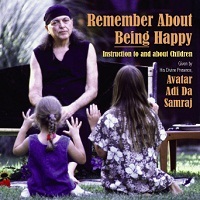 Avatar Adi Da Samraj Teaches children and young people how to be Happy no matter what the apparent conditions. Adi Da Himself always Demonstrated love and compassion in His interactions with young people and He never expected anything less from them than He did of adults: that they go beyond their egoic patterning by remembering to Be Love. In tracks 1 and 2, you will hear Adi Da respond to children and give them Instructions that are personal and specific to their growth and understanding. However, adults will also find His Instructions—on relating to others, practicing loving, and being Happy—to be profoundly useful.
. . . You must not merely wait for love to “happen” from you. You must practice loving one and all and All. You must communicate love to one and all and All. You must say and do “I love you” to one and all and All. You must do the things that are full of the feeling of love for one and all and All. You see? Avatar Adi Da also says that when caring for children and young adults, caregivers should always nurture, and challenge them to realize, “a breathing, feeling relationship to the Universal Power, the Divine Personality of God”. In the next section, “Grant Children Freedom and Responsibility”, you will hear Adi Da offer guidance in how to relate and serve children in the process of fully maturing and becoming a loving, balanced human being, capable of relating to others and to the Divine Itself. Adi Da also describes that the child’s need for and heart-impulse to liberation must always be respected and served. To this end, children need to progressively learn for real that the true source of life, sustenance, and happiness is the Divine Itself, not the mortal parents. Before you start to play, everything is always already OK. Everybody knows that. This CD is an expanded reissue of the 1984 audiotape cassette, Children Must Be Liberated, with Discourses recorded in 1978 at the Mountain Of Attention Sanctuary in California. New to this edition is “A Child’s Guide to Happiness”. This CD is a companion to The First Three Stages of Life, Serving the Right, True, and Free Development of Children and Young People and Completing the Human Work of Individuation, Socialization, and Integration for Adults. Click here to see full description.